(1) My daughter has anxiety. You can see it in her meltdown, shut down, upset tummy, fear of being wrong-fear of getting in trouble-fear of not fitting in-fear of standing out-etc. That she allowed herself to learn to chant the parsha, that she made it to the bimah to read (her tummy was really upset at the prospect) and that she stayed positive despite small mistakes in the reading of the last line is AMAZING! She showed dedication, maturity, courage and accomplishment! Fantastic job and quite amazing in my book! (2) The students - wow! 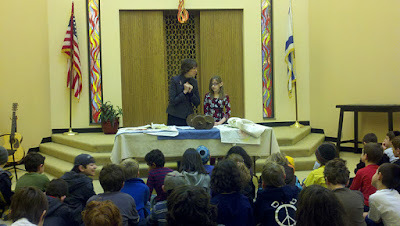 As Alia brought the Torah around, students patted her back and said kind words like, "You can do it!" They were unprompted! They just naturally supported her in this big moment. It nearly made me want to cry. 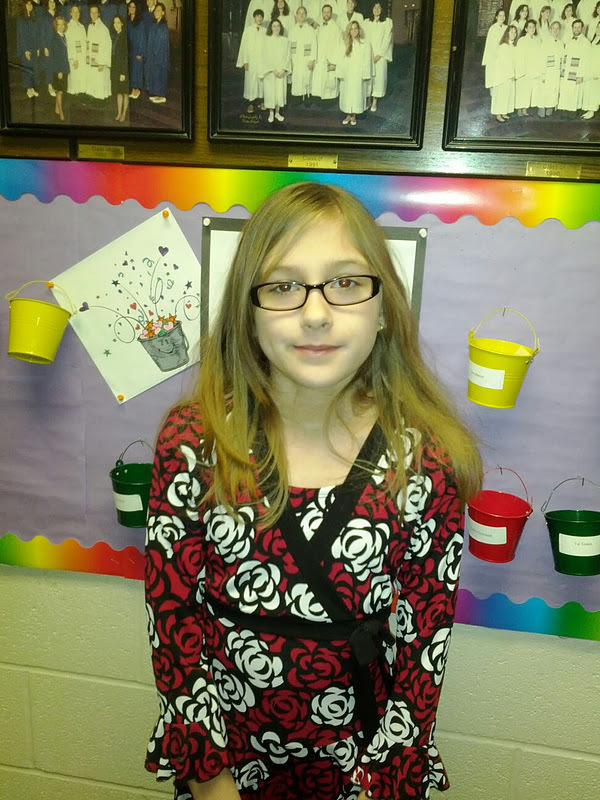 Afterwards, as she went around the room again with the Torah, students again patted her back as she went by and said things like "great job" and "good effort." They had smiles and again, supported her verbally with kindness. After the whole service was over, classmates came up to her and hugged her, told her that she was "awesome" and gave her big smiles! One of the girls she buddies, Ellye, ran up to Alia and gave her the sweetest hug ever, held both her hands, and just beamed with the best smile I may have ever seen! Amazing classmates! Amazing! (3) If you were there, you would have seen that through Alia's smiles, there was disappointment that she messed up. Morah Val and I exchanged knowing looks, and Morah Val commented that she is so hard on herself. So true. 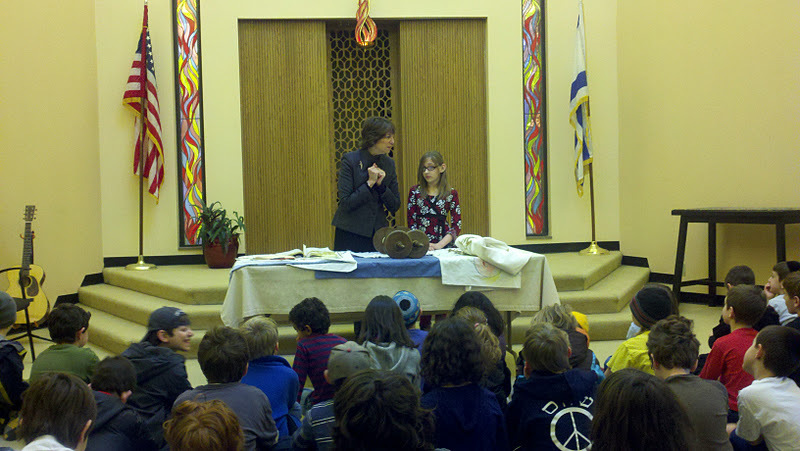 Morah Carol (who teaches Torah to the students) stood her in front of the ark and told the students how courageous Alia was for being on the bimah and chanting Torah for the first time. She acknowledged the difficulty with the third line and praised Alia for sticking with it and showing she was a leader. It was an acknowledgement of who my daughter is - a recognition of her struggles and a positive reminder of her accomplishments. These teachers at her school (as Morah Carol showed and Morah Val as well as her teachers, Shannon/Amanda recognize) KNOW the students - they are present, aware and are able to acknowledge the uniqueness of each child. They "get" Alia. For so many years, it has only been Rob and I who got Alia. Someone else - a whole slew of teachers that make up her team of educators - get her as well. Amazing! So you see...Alia's performance...the students...the teachers...all contributed to the amazing moment of her first chanting of Torah. If only Carol Rose had been there to see it...she would have been so proud! Alia mentioned she wished that she could have come...all the way from Canada! Video of her chanting Torah to follow sooooon! I wish I could have been there. Her school and classmates are awesome. Tell her I love her and am proud of her!